Automatic Emergency Braking - Do You Know How It Operates? We’ve come a long way from the mild-steel vehicles of the past. Technology is taking the collision industry in directions we never dreamed of. The changes we’ve seen in just the past few years are mind-boggling. And I do not believe the changes are going to stop anytime soon. Weight reduction for fuel economy and emissions, manufacturing costs, strength and corrosion issues all have had a role in changing vehicle designs. With all these factors driving automakers’ decisions, I believe we’ll be seeing even more advancements in vehicle materials in the very near future. But there are other factors influencing vehicle design behind the scenes that most of us in the collision repair industry do not see. I decided to take a look at some of these to try to give you a big picture view of what’s going on. First, when establishing the strength or crashworthiness of a vehicle, a body in white (BIW) is constructed. You’ve probably seen pictures of them and how the interior or main body structure is assembled and where all the different materials are located. BIW refers to the stage in automobile manufacturing in which a car body’s components have been joined together using one or a combination of different techniques: welding (spot, MIG/MAG), riveting, clinching, bonding, laser brazing, etc. The BIW happens before painting and before the engine, chassis subassemblies or trim (glass, door locks/handles, seats, upholstery, electronics, etc.) have been assembled in the frame structure. When you look at a picture or an actual BIW, what goes into each piece used in that vehicle? Why is that little piece of metal there? The manufacturers have so many reasons why that choice was made. Cost will always be factor one. But when does it justify a higher cost to use one material over the other? Strength: Different strengths of metals or composites are used to give a vehicle crashworthiness. This can be done with various grades of steel, aluminum and carbon fiber. We also see other metals such as magnesium being used as reinforcement, and how all the materials are joined together. Assembled using welds, squeeze type resistance spot welding, laser welds, brazing and rivets, mechanical attachment processes are on display and the BIW is tested to verify the structural integrity of the vehicle. Corrosion: The BIW also can be used to show where corrosion protection will be used – priming and adhesives or sealers to protect seams and joining areas. Integrity: Testing of the structure to determine its integrity and load stress is done to verify that the vehicle will hold up in a crash but also meet end of life of vehicle (ELV) requirements. Constant crash testing determines where reinforcements or vehicle strengths need to change before the final BIW is produced. Structures are designed to move and direct energy to provide the best protection for occupants. The exterior panels are then added and go through similar considerations. Aerodynamics, although they may not play as big a part in structural integrity, are added as well for the look of the vehicle. The determination of what part is used where and why is a painstakingly thought-out process with many factors. Weight: We all know that a lighter vehicle uses less fuel. The other end of that equation is fewer emissions. How much carbon will that vehicle create until its ELV? Many government programs have requirements and goals vehicle manufacturers must meet or else lose tax incentives or even face fines. Reducing the weight of a vehicle has one major challenge, however – as automakers find ways of making the vehicle structure lighter, the new electronics being added is putting weight back into the vehicle. This has led to the drive (pardon the pun) to hybrid electric vehicles or more fuel-efficient vehicles. Weight alone must be combined to meet requirements placed on the vehicle manufacturers. Metals or plastics being used today are designed to be light and strong, holding their shape without the need for reinforcements. A body line may add some looks but also keeps the metal or material stronger. A stiffener or stamped raised area offers strength without adding weight, as an insert or metal reinforcement would. Using aluminum instead of steel to reduce even grams of weight is a major consideration. Smaller vehicles more than likely will continue to have high percentages of high-strength steel as it may not be beneficial to use more expensive materials such as aluminum, carbon fiber and magnesium. With larger vehicles, using aluminum for weight reduction has more advantages cost-wise in manufacturing. How a part is made is a major factor in cost. Stamped parts, hydroforming and extruding are all complex processes. When everything was mild-strength steel, it was much simpler. Now, how do you stamp dual-phase steel? High-strength low-alloy steel, ultra-high-strength steel, 5000 series aluminum? Stronger metals sometimes are more brittle, and heat may be needed to form and not damage their mechanical properties. Another factor is engineering and manufacturing steel that is able to be stamped or formed without losing strength or its mechanical properties. No matter which way you look at it, forming parts for manufacturing has evolved into a very complex science of alloys and processes. The art of heating and quenching parts along with complex curves and body shapes – plus adding the weight factor to the equation – has resulted in a whole lot of thought being used to make a fender. Now add in aluminum and magnesium. All this has to be repeatable and use as few people as possible to keep the cost down. The amount of brain power to make a part for a vehicle is incredible – something we don’t think about when we pull it out of the box. We as technicians take a part out of the box and it looks flimsy. When mounted to the vehicle, it becomes a lot less flimsy. That’s engineering. A lot of it. We all take for granted how much thought goes into a part. Factoring in a vehicle’s carbon footprint actually surprised me as I never really thought that much about it. When I researched it, it suddenly made sense. When a vehicle drives down the road, it produces emissions. How much emissions are produced is the vehicle’s carbon footprint. Parts manufacturing has a similar consideration. How much energy does it take to produce the part? 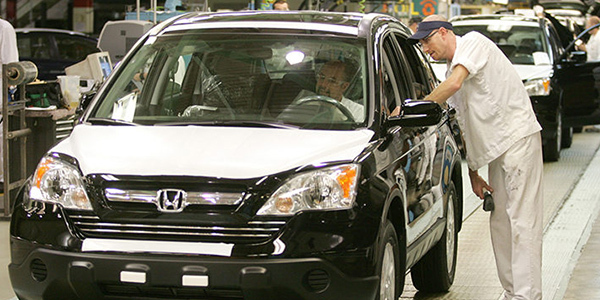 The carbon footprint of manufacturing a vehicle is a measurable factor. How much carbon from making the part to actually forming the part affects its cost? The decision between steel and aluminum or composites factors into how much of a carbon footprint these one million parts will produce. Another element to the carbon footprint is recyclability of the part and vehicle as a whole. Meeting the government’s 95 percent recyclability requirement is a factor when considering parts or materials used. Everyone shudders when they hear the word corrosion. Corrosion protection has always been a major concern with making a vehicle last to the ELV, which is why the type of material used and where it is located is considered. A steel bumper reinforcement in the front would be subject to a severely corrosive environment, so an aluminum part might be more beneficial due to its corrosion-resistant properties. Better methods of combining dissimilar materials such as steel and aluminum have made hybrid construction much more feasible. No longer is it just one choice; manufacturers have different options as to what they can use to achieve the desired results. Engineering and technology have given automakers more choices when it comes to assembling vehicles today. Each application and part has many variables to be worked out. Repairers may not realize what thought process was used to validate that direction of assembly. There are so many considerations that come into play, many things I can’t imagine. The issue is that we need to know how to repair vehicles correctly – not change vehicles to what we thought was right or even skip a step because we think it’s a waste of time. So the next time you look at a vehicle or part and ask, “What were they thinking?” remember it probably wasn’t about you.